One of the very special people in the food world is Danny Meyer! Not only is he an excellent restaurateur — running four restaurants in New York City, but he is an amazing contributor to his community through his efforts to help feed the hungry. The other night I was served this soup at a dinner that ZUNI CAFE hosted in San Francisco in his honor. 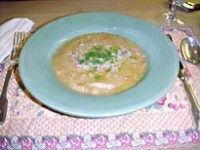 It is a perfect comforting soup for this time of year and pretty easy to make. The recipe is from Danny’s new book that he wrote with his chef Michael Romano called SECOND HELPINGS FROM UNION SQUARE CAFE, a wonderful new book! To soak the chickpeas, put them in a stainless steel bowl or plastic container with plenty of cold water and let rest overnight. 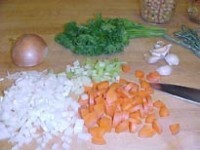 To make the soup, put the olive oil with the onion, carrots, and celery in a 3-quart pan over medium heat, and let cook, stirring from time to time, for about 5 minutes. Add the garlic, and cook another minute, stirring. 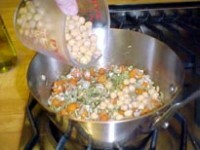 Add the chickpeas, the parsley, the parsley tied together with the bayleaf, the cheese, and the water. Stir while the soup comes to a boil. 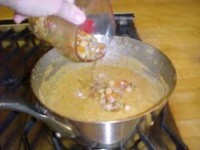 Add the sun-dried tomatoes, salt and Tabasco, and let simmer for about 50 minutes, until the chickpeas are tender, when tasted. 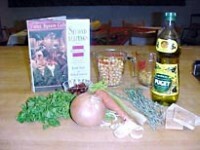 To cook the pasta, bring a pot of water to the boil, stir in the pasta, and cook until it is al dente. Drain. 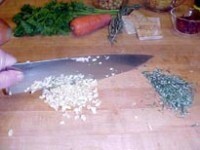 Serve the soup in warmed bowls, sprinkled with chopped parsley, grated cheese, and a teaspoon of extra-virgin olive oil.